Here’s an amazing fact: Farmington, New Mexico, a city of only 44,000 in the northwest corner of the state, has 58 parks. To put this in perspective, that’s nearly 44 acres per 1,000 residents. The national average is 10.1 acres, according to the 2018 Agency Performance Report prepared by the National Parks and Recreation Association. So yes, Farmington does love its outdoors, and no one exemplifies this better than Donna Thatcher. She is the teacher, tireless worker and one-woman show who makes the Farmington Museum’s Nature Center what it is — a wonderful natural and educational resource for both residents and visitors. 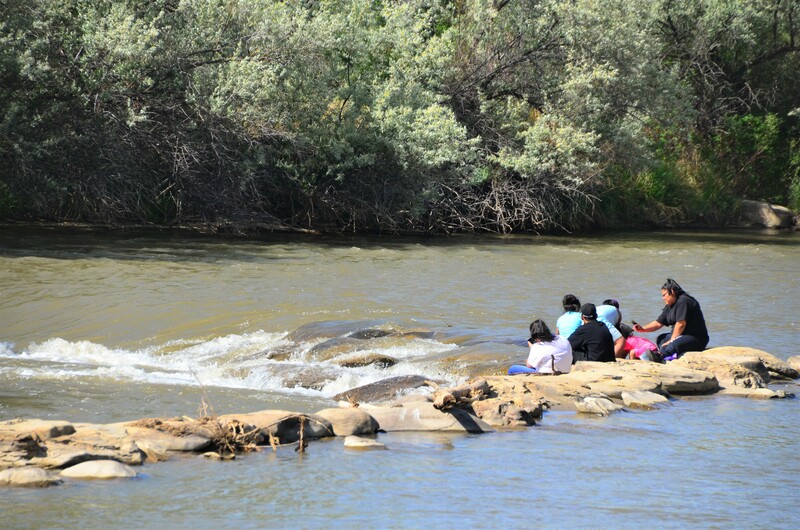 The center sits on a nature trail that hugs the Animas River and is visited daily by deer, various birds and resident Canada geese and their goslings (one mother has 13) that waddle around like they own the place. 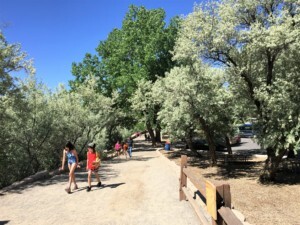 The New Mexico sun is intense, so when Thatcher takes us out on the trail, we are grateful for the enormous, stately cottonwoods — some half a millennium old — and renegade Russian olive trees that provide shade. Thatcher gives us a crash course in the area’s plants, animals and bugs, and shows off the herb and succulent gardens and recent improvements. We learn later that this leafy river corridor of pavers and groomed hard-packed gravel extends for eight-plus miles along the Animas. Everyone uses it — walkers, cyclers, horseback riders and birdwatchers, who can observe from well-placed benches. During another walk, I encounter a sizable snake meandering across the path heading toward the river. It seems unconcerned by the trail’s steady traffic, and I’m the only one who bothers to snap a photo. Farmington’s history dates to its first inhabitants 2,000 years ago. Then came the Navajo, Utes and Jicarilla Apache, followed by the Spanish, who settled in eastern San Juan County. Drawn by the confluence of three rivers — the Animas, La Plata and San Juan — the population began to grow in the 1870s with Mormon settlers and others. Today, the proximity of ancient dwellings and amazing natural landscapes draw visitors to Farmington. Using the town as a base, visitors can visit many Four Corners-area attractions; Shiprock Pinnacle; Four Corners Monument; and Aztec Ruins. The town of Farmington offers its own charm and fun. There is Lake Farmington where families can spend the day for $5 per vehicle, play in the sand and on the giant water toys, rent kayaks, try paddleboarding and eat icy treats from the Shiver Shack. In town, Adrienne Boggs, Farmington Museum’s education coordinator, gives tours of the historic downtown and regales visitors with stories from the past. There’s the one about the wealthy, elderly man and the young, single teacher who inherited his home; the divorce that determined the town’s street grid; and the downtown fire that was finally extinguished with dynamite. One building, a former drug store and then a newspaper office, took on new life when the Three Rivers Eatery & Brewhouse opened in 1997. It has expanded to three restaurants, a lounge and game room, all supervised by Jesse Gravelle, who arrived from Columbus, Ohio, in 2000. While Farmington celebrates its roots, it also looks forward. 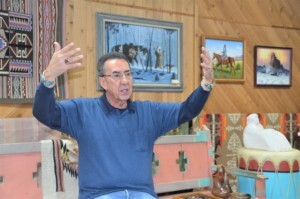 An extension of the Farmington Museum recently opened a downtown gallery to showcase Navajo art and culture, and there are big plans for renovating downtown. Smaller portions of the total project have been in the works, but the financial pieces for the major work came together recently “in the perfect storm,” explains Michael Bulloch, project coordinator. The six blocks of downtown will get a makeover with landscaping, seating, murals and sculptures. A water park is in the plans and some are working to create a system of river trails. Upcoming: Chaco Culture National Historical Park and Bisti Wilderness. See additional photos in and around Farmington at www.facebook.com/elouise.ondash. For more information, visit https://farmingtonnm.org/.